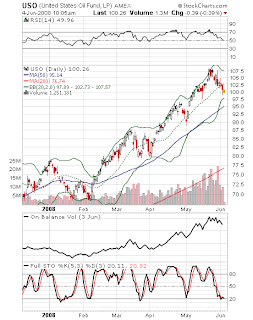 USO is starting to look interesting as a buy, but not at the current level. I have set my buypoint in the $95-96 range. The 50 day moving average should provide support for at least a bounce, and possibly a continuation of the upmove. The buy is contingent on volume contracting on the rest of the pullback. If I see more high volume down days, I will not enter.